We’d love your help. Let us know what’s wrong with this preview of An Amish Wedding Invitation by Serena B. Miller. Amish fiction author Serena B. Miller takes you "behind the barn door" in this true e-short account of her experience of attending an Amish wedding.In her years of researching her Amish novels, Serena Miller has gotten to know several Amish families in Holmes County, Ohio. 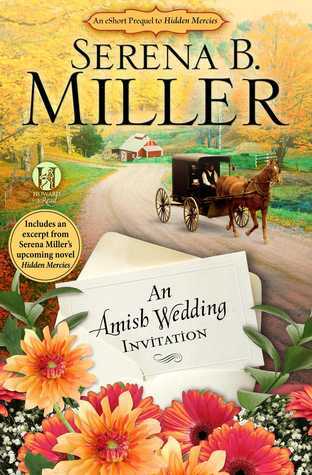 When she was invited to attend the wedding of one of her friend’s daughters, she expected it to be a Amish fiction author Serena B. Miller takes you "behind the barn door" in this true e-short account of her experience of attending an Amish wedding.In her years of researching her Amish novels, Serena Miller has gotten to know several Amish families in Holmes County, Ohio. When she was invited to attend the wedding of one of her friend’s daughters, she expected it to be a casual affair: muck out the barn, throw a potluck together, send the bride and groom off on their honeymoon in a buggy with a Just Married sign hung on the back. But when the young bride shyly brings her a formal, professionally printed invitation, she realized everything she thought she knew about Amish weddings was wrong. To ask other readers questions about An Amish Wedding Invitation, please sign up. Not only that, Serena real Serena B Miller was blessed to have made some very good friends among the Amish community who helped her to research her first novel Love Finds You in Sugarcreek Ohio and she was further blessed to receive an invitation to their daughter’s upcoming wedding. This book is about the author going to an Amish wedding. To me this book should be nonfiction since its based on facts but then again not one community, church district is the same. I gave it three stars since I have read alot of Amish books for three years, I felt that I didnt learn anything new. I do like her fictional Amish book. The book was an enjoyable read. However, I would have preferred more detail and reasoning behind this fascinating culture. I certainly did learn a lot from it. I live only a few miles from a flourishing Amish community and am blessed to count many Old Order Amish as friends. Love Finds You In Sugarcreek, Ohio is a natural outgrowth of my on-going fascination with these valiant, flawed people who struggle to live their lives according to their interpretation of the Bible. Once, when I apologized for asking so many questions while researching this book, an I live only a few miles from a flourishing Amish community and am blessed to count many Old Order Amish as friends. Love Finds You In Sugarcreek, Ohio is a natural outgrowth of my on-going fascination with these valiant, flawed people who struggle to live their lives according to their interpretation of the Bible. Once, when I apologized for asking so many questions while researching this book, an Amish father told me that I could ask anything I wanted. “Nothing is forbidden,” he said. He told me that he wanted my book to be accurate. I was thrilled when his family read it and gave me their enthusiastic nod of approval. Our family, however, also lived for many years in Michigan. My father, a sawyer, told me stories he had heard from old timber men who had cut the fabled giant pine in the Saginaw Valley. Visiting museums and reading about the years directly after the Civil War, when Michigan became the lumber capitol of the world, became a hobby. I was delighted when Revell Publishing allowed me to revisit that era by writing The Measure Of Katie Calloway.